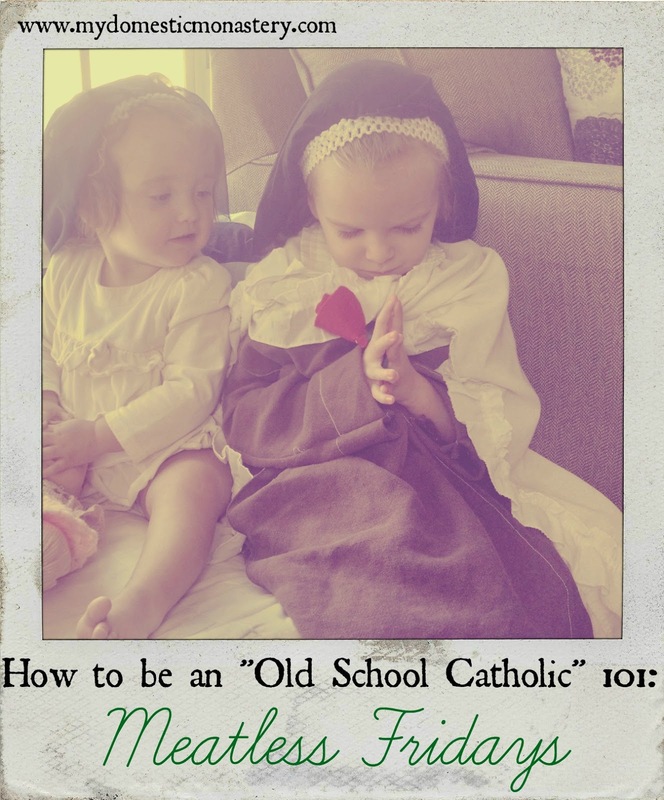 This post is the second part in a mini-series called "Old School Catholicism 101." Just for fun, we'll be spending this weekend looking at some of the "Old School" aspects of our faith culture, and why they're worth a try. Join us? So firstly...why are we supposed to do any penance at all? Is this just another thing that the Church is "making us do"? Let's start by clarify that all good parents "make" their children do things for their own good. When I "make" my children go to bed by a certain time, it is because I love them and I don't want them to be tired and miserable. If my children were able to understand the big picture of their health and well-being the way that I am, they would decide to go to bed early of their own accord. But, such as things are, they need my guidance. They need my rules. It isn't because they are dumb - it's because they are little, and they are in need of my care. It is a sign of my love that I give them guidelines. So it is with the Church, who is a "mother" to us, too. So, this guideline for penance is not a burden, but a blessing. It helps us to grow in love. The purpose of penance is to share to make amends for sin, yes, but it is also to learn to love as Christ did. When we suffer, we can offer our sufferings up, uniting them to the love of Jesus on the cross. A penance is, ultimately, a gift of love that we make to God, and that we may even offer up as a prayer for another person. So, penance is a good thing, but if we have to do a penance...why still abstain from meat? It's easy to abstain from meat every week. By that, I don't mean, "Take the easy way out!" I mean, "It's easier to do the same penance week after week." You're more likely to be able to take up the practice of weekly penance if you do the same penance week after week. Now, granted, we do do alternate penances in our family under some circumstances - while traveling, while visiting family or friends. So, it is nice to have the option to pick an alternate penance. But, there is something uncomplicated in choosing the same penance week after week. There is something soothing about traditions. They make us feel connected to people we love, and to those who have come before us. Traditions around holidays are a perfect example of this. Meatless Fridays are a bit old school...but in a kind of cool way. It's part of what makes us "us." Own it! Do you have any special practices your family does on Fridays? Any meatless recipes to share? My family does meatless Fridays. My husband's family always did and when we started dating it was a new concept for me. I had grown up with meatless Fridays during Lent, but that was it. Now that I'm used to it, I like it. I agree, it is much easier to keep it up when it is routine. Don't really have any recipes to share myself, although Catholic Sistas has a meatless meals board on Pinterest. I check there on occasion when I need some inspiration. Hi Michele, I'm just finding your blog and really enjoying it! I also do meatless Fridays. It's just a tradition I started for myself after reading about the desert fathers. I don't find it that hard to keep - there are plenty of vegetarian options in my city - but I don't know many other people who do, so it takes discipline on my part. Do you also do meatless advents and lents?